I, Dave M. Strom, am a technical writer, comic book geek, and budding novelist and short story writer. So far, I specialize in bringing to life Holly Hansson, the Super(wo)man who’d rather be Clark Kent. She’s a writer also. Why the “M” in my name here? 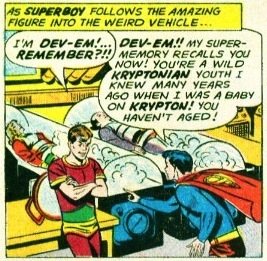 I am thinking of the old Superboy foe, Dev-Em, the juvenile delinquent from Krypton. I love that goofy old line, “Dev-Em! My super-memory recalls you!” Dave M. sounds a bit like Dev-Em, a bit Kryptonian, and that amuses me. So I am using it. Even though I am not super in any way. I am old enough to have read that Superboy comic book where Dev-Em first appeared. oh hey,. you’re the guy who did those back-page ‘funny stats’ things for Amazing Heroes, right? Yeah, I wrote Strom’s Index. Thanks for remembering. It helped pay for my weekly comic books. Easiest first draft I ever wrote was the Index about The Punisher movie starring Dolph Lundgren (I did that while watching in a comic book shop on videotape).